The International Annals of Criminology is an international and multidisciplinary journal devoted to the study of crime and crime prevention. 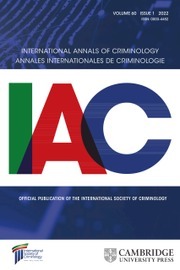 Published by the International Society of Criminology, the Annals is one of the oldest continuously published scholarly journals in the area of criminology. Its mission is to further the dissemination of original international material on criminology and criminal justice, with a particular focus on different contexts beyond Europe and North America. The Annals welcomes contributions relating to crime, cybercrime, crime prevention, criminal law, medico-legal subject matters, and the administration of criminal justice and provides a platform for learning, debate, and collaboration among criminologists, policy makers, professionals, and practitioners worldwide.